WENDT, William (1865-1946), was born on February 20, 1865 in Bentzen, Germany. In 1880, at the age of fifteen, Wendt immigrated to the United States and worked in Chicago as a staff artist where he painted formula pictures. In his free time the young Wendt displayed a love for easel painting and began to develop a personal style of painting. In 1894 and 1896, Wendt traveled and painted with his friend George Gardner Symons visting England and California, and later traveled to the East Coast, Germany and France. He married the sculptress Julia Bracken in 1906, and he and his bride then made the decision to move to California. Wendt became one of California's best-known landscape painters of the late 19th and early 20th centuries. He was called the "Dean of Southern California landscape painters." His landscapes were especially known for rich greens and browns. In 1911, he became co-founder of the California Art Club along with his wife Julia Bracken Wendt, which he served as the second and fourth President from 1911 to 1919 and 1917 to 1918 respectively. 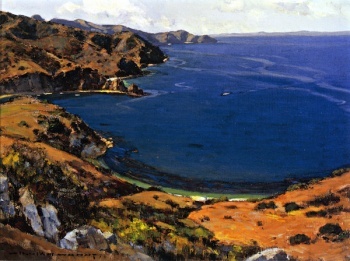 This organization reflected his commitment to plein-air painting of the California landscape. Wendt built his studio in Laguna Beach, California. A Laguna street, Wendt Terrace, bears his name. Wendt died in Laguna Beach, California on December 29, 1946. This page was last edited on 2 October 2015, at 17:32.